Where can I stream to with Webcaster X2? Webcaster X2 can stream to your YouTube Channel or Events you create on YouTube, to your Facebook Timeline, or to a Facebook Page, Event or Group for which you have permissions to post. How does Webcaster X2 work? 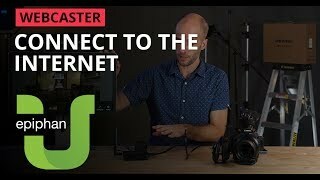 Connect your HDMI source (camera, laptop etc.) to Webcaster X2. Connect to your network either with an Ethernet cable or configure Wi-Fi settings using an external display and mouse. Double-press the multi-function power button on the side of Webcaster X2 to toggle between Facebook or YouTube streaming. You will see a device code on the Webcaster X2 LCD with which you can pair your YouTube or Facebook account to the device. Once your device is paired, press the multi-function power button once to start streaming! What kinds of inputs does Webcaster X2 support? And how many? You can connect one HDMI source to Webcaster X2. This is usually an HD video camera, but could also be a mixer or other device with HDMI output. A USB camera can also be connected, but this is a beta feature and is not fully supported. Can I connect a USB camera to Webcaster X2? 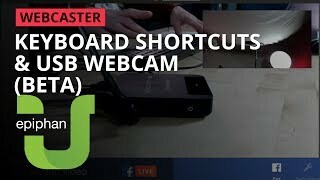 You can enable a beta feature to support USB cameras with Webcaster X2. Because this feature is not fully tested, we cannot guarantee your success when using a USB camera. We’d be happy to hear from you regarding USB cameras you’ve found work or don’t work with Webcaster X2. Email info@epiphan.com with the camera model(s) and results. Visit the Webcaster X2 User Guide to learn how to enable USB cameras. Can I stream to YouTube and Facebook at the same time? No. Webcaster X2 streams to either Facebook Live or to YouTube. Do I need anything other than Webcaster X2 to start streaming? 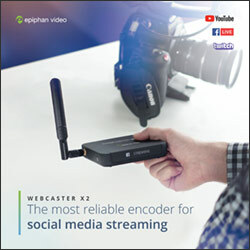 You’ll need your Webcaster X2, an account on Facebook or YouTube, and a network connection that has access to Facebook or YouTube. You can optionally connect a keyboard, mouse, and HDMI display to monitor your stream, view comments, engage with viewers and configure stream settings. How do I start and stop my stream? You can start and stop your stream by pressing the multi-function button on the side of the Webcaster X2 device. If using an external display, you can also end your stream by clicking the ‘Start’ or “Stop” button in the Webcaster X2 interface. Can I save my streams as videos on Facebook or YouTube? Ye – when a live stream is ended, YouTube and Facebook automatically saves video to your account. Note – On Facebook, streams set to continuous are not saved when finished. 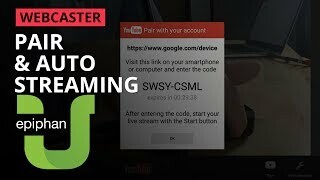 Can I use Webcaster X2 to stream to someone else's YouTube or Facebook accounts on their behalf? Yes! You can easily unpair Webcaster X2 from your account, then your friend only needs to enter the device code shown on the LCD into their Facebook and YouTube account and the device will now be paired to their account. Yes. You can configure your stream for a YouTube Live Event using the Webcaster X2 interface on an external display. 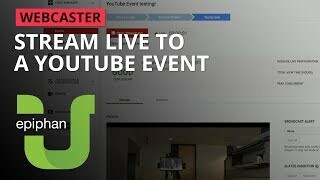 See How to live stream to a YouTube Live Event for more information. By default, Webcaster X2 posts to your Timeline, but can be configured to post to a Page, Event or Group. You can use Webcaster X2 to configure the privacy of the video streamed to account. The stream’s privacy setting affects who is notified of your live stream as well as who can see it. You can also change the stream’s privacy setting from your Facebook or YouTube account once your stream is live. Is Webcaster X2 secure? I don’t want my YouTube of Facebook account getting hacked! 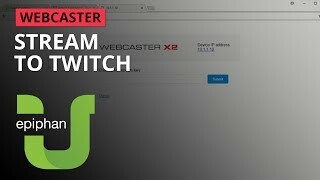 Webcaster X2 is a fully secure social media streaming solution. To pair the device with your account you need a unique randomly-generated code which gives the device limited access to your account. How do I connect Webcaster X2 to my network? You can connect Webcaster X2 to your network by wired Ethernet of WiFi. For details on how to configure your Wi-Fi settings, see the Webcaster X2 user guide. 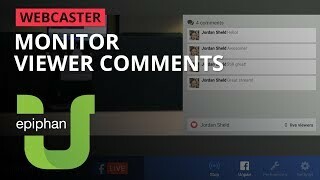 Webcaster X2 imposes no limits on the length of your live video stream. However Facebook Live only supports streams up to 4 hours in length, unless they are configured as a continuous live stream. 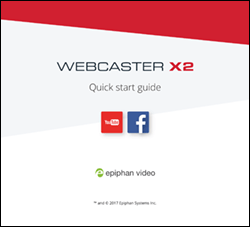 See the Webcaster X2 user guide for more information on continuous live streams. You can configure your Webcaster X2 through the device interface, by connecting an external display and mouse. See the Webcaster X2 user guide for more information on configuring your device. 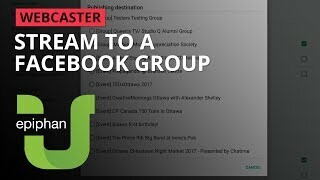 Is Webcaster X2 linked permanently with my YouTube or Facebook account? Webcaster X2 can be paired to any YouTube or Facebook account and you can unpair anytime. You can also configure your device to unpair from your account upon powering off the device. How do I set my video title and description? Titles, descriptions and other metadata can be setup using the device interface, by connecting an external monitor and mouse to your Webcaster X2. How does audio work with Webcaster X2? 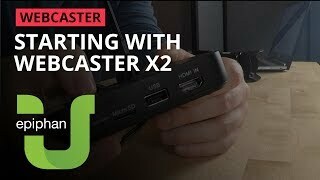 Webcaster X2 supports audio over its HDMI input port. For example, you can connect any wired or wireless mic to your camera to get professional HDMI audio alongside your video. What input resolutions can Webcaster X2 accept? Webcaster X2 accepts HDMI input from 720p (30 or 60 fps) and 1080p (30 fps or 60 fps) sources. Only these input types are supported. Interlaced signals and other frame rates are not supported. Will Webcaster X2 have firmware updates? Webcaster X2 will have occasional firmware updates. Customers who have registered their device will be notified via e-mail of any new firmware upgrades. The product registration page can be found here. What resolution can Webcaster X2 output? What about bit rate and frame rate? Webcaster X2 supports output in frame sizes up to 1080p (1920×1080) for YouTube and Facebook. Webcaster X2 streams at 30 fps and at bit rates up to 4 Mb/s.